HARPERCOLLINS PUBLISHERS LTD. PAPERBACK. 0049100734 Like New Condition. . Fine. HARPERCOLLINS PUBLISHERS LTD. PAPERBACK. 0049100734 New Condition. . New. PENGUIN BOOKS LTD, 1969-01-01. Paperback. Used:Good. VG. In white, decor. cloth. Lt. soiling, o/w tight, bright copy., Without DJ Illus. by Eric Palmquist Pacific / expedition Allen & Unwin 1965 1st, this ed. 10 1/2 x 8 1/2", 222 pp., A famous account is a newly illustrated edition. Black & white photographs mixed with striking color drawings produce a most, attractive book. London: The Folio Society, 1996. First Folio Society printing. Cloth-bound hardcover in gilt decorated slipcase. A Fine copy in brand new condition, in a Near Fine slipcase which has one tiny, faint stain. An excellent copy..
London: George Allen & Unwin, 1950. brown blindstamped cloth with some light marks to corners, rubbing, bumps, b/w plates inc. frontis, coloured top, 236pp. 1st Edition 5th Impression. Hard Back. Good/No DJ. 8vo - over 7¾" - 9¾" tall. Penguin. 1963. Trade paperback. Very good. No dust jacket as issued. Satisfaction Guaranteed, fast shipping, please feel free to ask any questions!. 235p., ill., 19 cm. . This translation originally published (B50-2788), Allen & Unwin, 1950, and classified at 910.4. . Condition: Very good. No dust jacket as issued. Satisfaction Guaranteed, fast shipping, please feel free to ask any questions! London: Allen & Unwin, 1964. Very large, very heavy book, quality gray cloth with Polynesian face on front, tinted photo of team inside front cover and adjacent end papers, another onboard raft inside back cover and adjacent end paper, 224 pages in double-column format, profuselly illustrated, many drawings in color. DJ glossy white background with color-illustration of raft with sails in rough seas on front, spine and back, flying fish on back. DJ has a few tears and nicks to spine and back edges. Near Very Good DJ/Very Fine book.. Cloth. Fine/Near Very Good. Illus. by Palmquist, Eric. 4to - over 9¾" - 12" tall. London: Longmans, Green and Company, 1957. Paperback. VG. Wraps in white spine, orange and blue decorative paper covers. Fair amount of rubbing at the head and tail of the spine and at the tips of the corners. Light rubbing around the outside edges of the covers. Slight spine lean toward the front of the book. Some facial tears and tape marks on the inside of the front and rear covers. Previous owner's name on the half title page. Some evidence of handling on the first and last few pages. Part of "The Bridge Series," edited and abridged by G. C. Thornley. Illustrations by G. S. Ronalds. 146 pages. Uncommon. U.K.: George Allen & Unwin Ltd., 1948 Notation on blank page indicating that the book was purchased in 1960 at the Kon-Tiki Museum. Otherwise unmarked and in good to very good condition. Small tear on DJ, but DJ is in fairly good shape. London: Folio Society. 1996. Translated by F.H. Lyon. Introduced by Tim Severin. 298pp, b&w photographs, endpaper maps. Decorated cloth with the slipcase. A fine clean copy. .
George Allen & Unwin Ltd. Used - Acceptable. Ships from the UK. Former Library book. Shows definite wear, and perhaps considerable marking on inside. 100% Money Back Guarantee. Your purchase also supports literacy charities. George Allen & Unwin Ltd. Used - Good. Ships from the UK. Former Library book. Shows some signs of wear, and may have some markings on the inside. 100% Money Back Guarantee. Your purchase also supports literacy charities. London: Allen & Unwin, 1963. Hard cover. Good. No dust jacket. 235 p. illus. 23 cm. Inscribed "Greetings from "Kon-Tiki-Hermans brother. Hansjacob Watzinger. Herman Watzinger was one of the original crew members. London: George Allen & Unwin, 1951. The story of one of the bravest men of our times who endured the lonely terrors of crossing the mighty Pacific Ocean in a balsa raft so frail that many predicted he would not last a single hour. Gift inscription to endpaper else a clean, square hardback in a d/w which has large loss to rear cover - 235 pages including index. Illustrated with b/w photographs. Prompt dispatch.. Fifteenth Impression. Hard Cover. Good/Poor. 8vo. International Collectors Library. Hardcover. B0000CHM60 . New. Rand McNally, 1951. Hardcover. Acceptable. 1951. fourteenth printing. 304 pages. No dust jacket. Blue cloth boards with decoration. 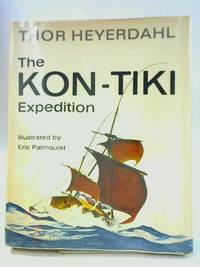 Contains black and white photographic plates and the map of the Kon-Tiki Expedition illustrated to front and rear pastedowns and endpapers. Pages are clear, with light thumbing and tanning throughout. Heavy tanning to rough-cut text block edges and staining to pastedowns. Boards and spine are heavily worn, with rubbing and staining to both surfaces. Heavy bumping to corners and crushing to spine ends, causing cloth to fray. Heavy marking and sunning. Allen & Unwin, 1964. Hardcover. Good/Good. 1964. 222 pages. This is an ex-Library book. Ex-library copy with expected inserts, stamps and inscriptions. Illustrated jacket over tan cloth boards. Bright pages with light wear and tanning to text block edges. Library marks and labels to pastedowns, endpapers and title pages. Book is covered in plastic with wear to exposed board edges. Jacket is covered in plastic and has light edge wear and creasing al over. Light tanning to plastic cover.